Francesca Woodman, Self-Deceit no. 5, Rome, 1977-78. Top: René Magritte, La Gâcheuse (The Bungler), 1935. 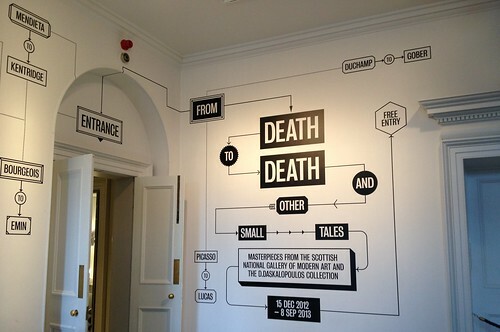 Following the exhibition’s graphic introduction, a flow chart painted in black and white (designed by Sumo) across the foyer walls, the gallery’s long corridor peels off to reveal artworks that ask the viewer to consider mortality and the body. Obscure examples include Sarah Lucas’s Bunny Gets Snookered and Helen Chadwick’s Piss Flowers. 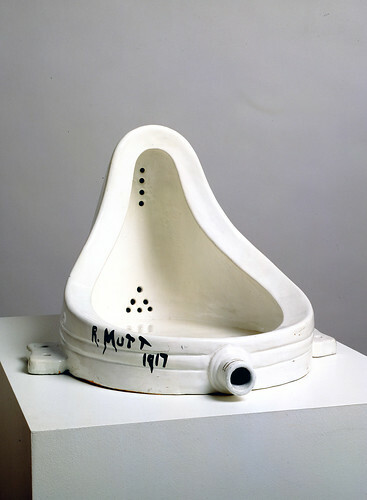 Other displays feature Marcel Duchamp’s Fountain and René Magritte’s Le Miroir Magique plus pieces by Marina Abramovic, Tracey Emin and Matthew Barney. Installation image of the Scottish National Gallery of Modern Art (One). ‘Flow chart’ signs designed by Sumo. Hans Bellmer’s 1949 photobook Les Jeux de la Poupée (The Games of the Doll) illustrated with poems by Paul Éluard, is filled with disturbing photographs of dolls. 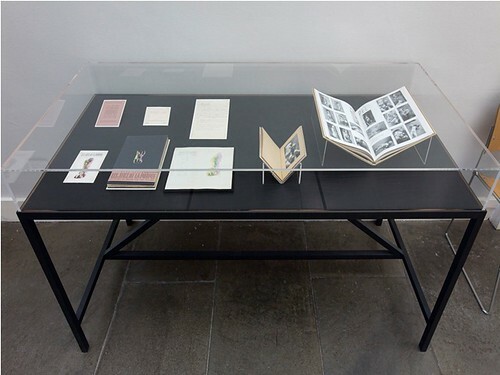 Dismembered and reattached in unnatural or incomplete formations, the hand-coloured black and white photographs are coupled with rose-tinted design features and are displayed alongside subscription cards and pages of Bellmer’s preliminary design notes. Installation image of Hans Bellmer’s photobook Les Jeux de la Poupée (The Games of the Doll), 1949. Hans Bellmer, La Poupée (The Doll), 1949. American sculptor Robert Gober (b. 1954) features heavily across both floors of the exhibition but it is his litho prints that first introduce his common themes of confinement and catholic guilt. 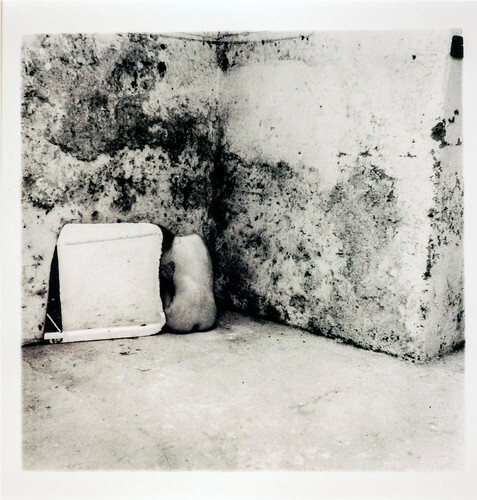 Untitled (2002) expands on the crosshatched jail cell window featured in an earlier Untitled (2000) with protruding barren tree branches, a blocked-off cellar door and two feet atop fallen leaves. The upside down Mayo mayonnaise logo somehow grounds the piece in the imagination. A portion of Douglas Gordon’s 100 Blind Stars installation features on the gallery’s first floor. The series uses publicity photographs of celebrities and cuts away their eyes. The impact of this simple gesture is remarkable – more so when a mirror is placed behind the cut-outs and viewers are encouraged to align their eyes to the gaps. The stars stare back with renewed life. Douglas Gordon’s ‘Sharpening Fantasy, 2012’ will be exhibited at Blain Southern, Berlin 7 February > 28 April 2013. 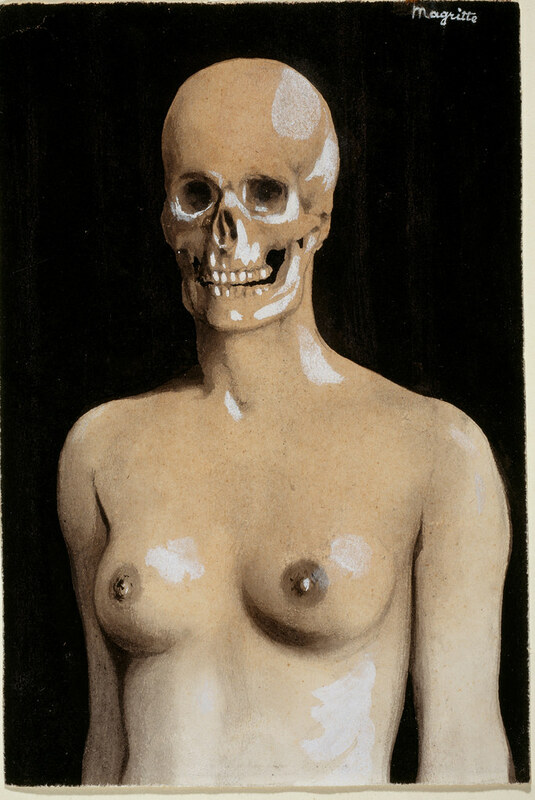 ‘From Death to Death and Other Small Tales: Masterpieces from the Scottish National Gallery of Modern Art and the D. Daskalopoulos Collection’ continues until 8 September 2013.